This week, One Fat Frog is having a sale on our used commercial meat slicer on top of our already low, low prices! We have a wide variety of brands, including Hobart, Berkel, and Globe Chefmate. Looking for a light-duty manual slicer, with a 9″ hollow-ground hollow-ground slicing knife, belt-driven 1/4 hp motor, heavy gauge anodized aluminum body, top-mounted, two-stone, all-metal knife sharpeners, and a unique chute angle makes it easy for the operator to see sliced product? No problem, we got your covered at One Fat Frog. Stop on by one of our two Central Florida locations and check out our wide selection of commercial meat slicers. One Fat Frog buys, sells, trades, financed, and leases used and new restaurant equipment (everything from huge commercial ovens and coolers to small wares and furniture! ), and offers free custom paint jobs, free custom cutting boards, free gas conversion, and free deliveries to more parts of Florida than any other dealer, including Gainesville, Jacksonville, and Tampa. One Fat Frog Restaurant Equipment offers easy financing for these used commercial meat slicers. 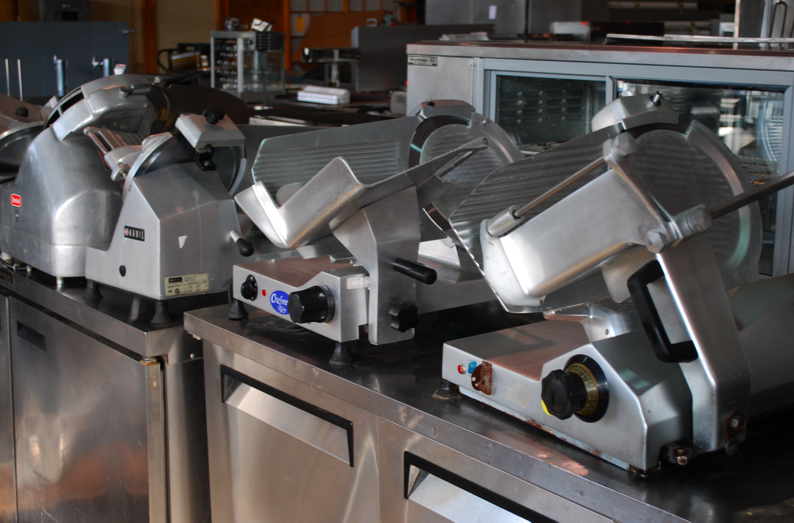 One Fat Frog Restaurant Equipment also welcomes quick cash and package deals towards the entire stock of used commercial restaurant equipment, including these used commercial meat slicers! Come into One Fat Frog Restaurant Equipment today and check out our inventory! Remember, we also take trades and buy used equipment on the spot for cash!